VIDEO: Connecticut's Sustainable America Doing Great Work! Cheese Making Class - @ Olivette Darien, March 23rd! Learn to make a remarkably simple and tasty yogurt cheese called labneh, a quick, easy and economical farmhouse ricotta and a delicious lemon and honey dessert cheese that is great for stuffing French toast or filling crepes! Learn all about raw vs pasteurized milk, the type of equipment you will need, the best ingredients to use, where to buy the best ingredients and how to safely make, season and store your own artisan cheese. Click here to register. *Price includes a welcome glass of sparkling wine, all materials for the class, each cheese making demo and tastes of the 3 cheeses made: ricotta over croccantini with aged balsamic drizzle, labneh with garlic olive oil and herbs over crostini and the dessert cheese topped with organic fig marmalade. A lifelong artist and an organic farmer and cheese maker for over 20 years, Carol Lake is a passionate educator that uses her art, farming and cheese making to encourage others to see the beauty of the natural world around them. “Basic, simple foods are what we have thrived on as a species for hundreds of generations”, she says. “It’s time to bring back that instinctual knowledge of simple things, like how to make cheese from good, fresh milk and other pronounceable ingredients.” Carol thoroughly enjoys teaching others how to avoid some of those very pitfalls, and shows us just how simple and cost effective it is to eat delicious, homemade artisan cheese! Alina Lawrence is an olive oil educator, speaker, consultant and owner of Olivette, boutique olive oil tasting rooms in Darien, CT and Westport, CT. Alina received her training and certification in olive oil sensory analysis from the National Organization of Olive Oil Tasters (ONAOO) in Imperia, Italy and The Robert Mondavi Institute at the University of California at Davis. Alina grew up in Europe; and from a young age, she started spending time in the kitchen with her grandmother making everything from scratch. There, in her grandmother’s kitchen she learned to appreciate quality food made from locally sourced, artisan ingredients! What: The Westport Farmers’ Market (WFM) wants you to fall in love with your kitchen again. While creating a thriving local hub for seasonal food, WFM has arranged for 19 of the top area chefs, mixologists, and butchers to do delicious, live recipe demonstrations featuring fresh, local foods found each week at the market. Learn how to use locally grown and produced, seasonal ingredients found at the market to prepare fresh, easy meals for your family. The season kicked off with the Staples High School Culinary Arts team, then Sugar & Olives “ramped” up the demo with their pickled ramp recipe and tutorial, followed by a lesson in how to properly harvest ramps. Attend these free events and receive recipe cards to prepare the featured dish at home using the same market ingredients. Every chef demo will feature a local chef or food professional who supports the local food culture and the WFM. Click here for the chef demo list and more information from Fairfield Green Food Guide. May 13th - Where the Wild foods are! BUN LAI, world renowned chef, national James Beard Award semi-finalist and proprietor of New Haven, CT’s Miya’s Sushi, serving innovative sushi from sustainable and locally obtained and foraged flora and fauna, including invasive species. JOE ROMAN, conservation biologist, researcher and educator, award-winning author, and founder/editor ‘n’ chef of the courageous culinary website, Eat the Invaders: Fighting Invasive Species, One Bite at a Time. When: Tuesday, May 13th 6-9 p.m.
For more background on Bun and Joe: click here . To make your reservation online: click here. To download a mail-in reservation form: click here. What: Foodshare, Central Connecticut’s regional food bank, is holding a fundraiser to raise money for the fight against hunger in Connecticut. There will be a "green" tour of Foodshare, as well as many opportunities to learn about, try, and buy leading local non toxic, organic and non-GMO personal care items, cosmetics, household cleaners and more. Enter for a chance to win the "Great Green Giveaway" and receive amazing discounts from eco-kids and Frey Vineyards in addition to some complementary packets of non-GMO seeds. For more information about this event and to RSVP, which is kindly requested, email Jenn Chapin at thenontoxiclife.com, call her at (860) 817-8383 or visit this event on Facebook at www.facebook.com/thenontoxiclife and click on "Events." What: Hundreds of guests eager to sample local, artisan and organic food, attend tasting workshops, and learn about homesteading are expected to flock to Audubon Greenwich’s Sustainable Food & Farm Expo. Eighteen exhibitors and vendors, including organic farmers, homesteading experts, artisan food producers, specialty food retailers, and organic restaurants, will be present to share their products and expertise with attendees. Advance reservations highly recommended for all Tasting Workshops as capacity is limited. Send all RSVPs to Jeff Cordulack at greenwichcenter@audubon.org or 203-869-5272 x239. Please leave a best phone number so that Audubon can contact you back to process your payment and reserve your seat. What: CT NOFA's annual Getting Started in Organic Farming Conference provides information about agricultural practices, marketing, planning and management for those who are establishing a new form or are transitioning to organic production. Attendees have access to valuable support and resources as well as a unique opportunity to interact with knowledgeable experts and established farmers, and they can connect to other beginning farmers from their area. The 2014 lineup includes presentations from Patrick Horan of Waldingfield Farm, Marjorie Glover of Happy Family Farm, Kip Kolesinskas from the American Farmland Trust, Eero Ruutilla an Sustainable Agriculture Specialist for UCONN Cooperative Extension, Mark Rutkowski of Urban Oaks Farm, Erin Pirro of Farm Credit East, and CT NOFA Board Member Debra Sloane of Sloane Farm. Lunch will be provided, as well as opportunities for attendees to network with one another. A limited number of scholarships are available to beginning farmers with less than 10 years of farming experience who would otherwise have difficulty attending. Registration for the conference is $40 for CT NOFA Members and students and $50 for Non-Members. To register, apply for a scholarship or for more information, visit[[http:ctnofa.org|ctnofa.org]] and click onGetting Started in Organic Farming Conference, or call the CT NOFA office at 203.308.2584. Earlier this month, the Burns & Hammond team had the opportunity to spend the weekend with 22 13 to 18 year olds from East Harlem, to conduct a Sustainability Base Camp field trip to various different sites in Boston! This was a truly fascinating experience, not only for the newly crowned Eco-Champions, but for myself and the organizers as well. Our day began at The Food Project in Roxbury, MA, where we all got the opportunity to explore their multitude of lush, community gardens. This is where the kids could see a real revitalization that was made in a low income neighborhood. It was incredible to observe the high level of interest in some of their eyes as we walked through the neighborhood that had plentiful green gardens full of delicious vegetables scattered throughout a concrete jungle. Thanks to our gracious hosts at The Food Project, all of the burning questions asked were answered thoroughly, along with ideas for instituting similar projects in their own East Harlem community. Finally before we trekked back to the hotel for the night, we made a stop at the largest wind turbine testing facility in the nation! Thanks to Executive Director Rahul Yarala, the tour of the Massachusetts Clean Energy Center’s Wind Technology Testing Center included an overview of wind energy as a whole, the process by which wind turbines are constructed and an in depth look at the rigorous testing of the turbines they do in order to make sure they will be able to withstand any outdoor conditions. As someone who has always been interested in and studied alternative energy, being in the heart of a facility that is striving to be a leader in wind was amazing. It also seemed like an eye-opening experience for the students because it was a concrete example of what people are doing on a larger scale to become energy independent and sustainable. The next day consisted of strolling through the Sustainable Business Network of Massachusetts' Local Food Festival, where hundreds of vendors lined the streets of Boston selling bread, veggies, ice cream and so much more. The local food movement has really been taking off over the past few years, and this was a perfect example of how it has. These farms and stores of the Boston area graciously gave out delicious samples of their products, allowing everyone to try just about everything! Unfortunately, this was the last stop on our trip. As the Burns & Hammond team said goodbyes to the Eco-Champions, I had expected to feel a bit of sadness as our time together was over. Instead, I felt a sense of relief that these students had the opportunity to go on a trip like this, and knew that this had really hit home for many of them. It might be wishful thinking to expect all 22 students to go on and eventually become green collared professionals, but hearing the questions they asked, and inspired thoughts about careers that came out of many were enough to make me to believe that this was a positive experience for all. This Sustainability Base Camp was just a building block that added to their environmental awareness, but one that provided a solid foundation due to its real life relatability for these Eco-Champions. What: The Friends of Ambler Farm have made it the farm’s mission to celebrate Wilton’s agrarian roots through active-learning programs, sustainable agriculture, responsible land stewardship, and historic preservation. Ambler Farm Day, an important fundraiser which helps sustain educational programming, is back for a 13th year! Bring the entire family to enjoy a fun-filled afternoon at Wilton’s community farm. Live Music and Delicious Refreshments! Where: Ambler Farm 257 Hurlbutt Street, Wilton, CT.
$20/family. $10/seniors. A free shuttle bus will run from Cannondale train station. All proceeds will benefit the restoration of the historic Raymond-Ambler Farmhouse as well as ongoing educational programs. The farm has their weekly stand at 257 Hurlbutt Street Saturdays through October from 9am-2pm. Their produce is also sold at the Wilton Chamber of Commerce Farmer’s Market at 224 Danbury Road from 12:30 – 5pm on Wednesdays through October. What: The final farm to table event. For $75.00 per person, you can warm the palate with a welcome cocktail and sampling of small bites, followed by a family-style meal ripe with the season’s finest local ingredients, custom cocktails and wine parings presented by Bootleg Greg and an all-you-can-indulge dessert bar. The menus for the series – much like the restaurant’s farm to table philosophy – focuses on local ingredients, sustainable products, and responsible farming. The menu will be inspired by the farms fresh offerings that day. When: September 21st, 7:00 p.m.
Where: Parallel Post Restaurant 180 Hawley Lane, Trumbull Marriott. Tickets to Farm-to-Trumbull are $75.00 per person plus tax and 18% gratuity and must be purchased in advance. RSVP: farmtotrumbull@gmail.com or call 203.380.6380. For more information about Parallel Post Restaurant visit them online. If you've got nothing planned this Thursday night, you may want to head over to Chocopologie in South Norwalk. Franz Knipschildt, renowned chocolatier of Knipschildt chocolates and the Chocopologie restaurants in South Norwalk and New Haven, has paired up with Red Bee Honey. Marina Marchese, founder of Red Bee Honey, will help present the menu of dark chocolate with artisanal honey made by her own Italian bees. Tickets are $75 per person and the event runs from 7:00 p.m. to 9:30 p.m. Chocopologie is located at 12 South Main Street in South Norwalk. Call to RSVP at 203-854-4754 or e-mail at info@chocopologie.com. The GMO-free and GMO-labeling movements are active nationwide and are determined to regain a healthy, sustainable food system in the US. Join us for an evening of food, film & thought-provoking discussion with experts and advocates who are working to enable positive change. Analise Paik ~ Empowering Consumers to Choose Non-GMO: Since GMOs are not labeled yet, consumers need a holistic framework, along with some simple tools, for determining which products are GMOs and which aren’t. Analiese Paik, founder ofFairfield Green Food Guide and a board member of Slow Food Metro North, will explain the best ways to identify and avoid GMOs when shopping and dining. Includes Q&A. Representative Fred Camillo ~ GMO Legislative Update: 50 other countries have federal labeling laws; why not the US? What are the prospects for a GMO labeling bill in CT? Our special guest speaker, CT Representative Fred Camillo, will comment on last year’s efforts in Hartford, take questions from the audience, and outline what is needed in Connecticut to get a GMO labeling passed. Presented in partnership with Slow Food Metro North & the Fairfield Green Food Guide. Backyard Beekeeping Course by Expert @ Flanders Nature Center! Learn how to raise your own bees for honey from one of the area's top experts, Al Avitabile, Emeritus Professor at the Biology Dept. of UCONN, and co-author of “The Beekeeper’s Handbook”. In this five-session course Al will give you the beekeeping tools and confidence necessary for setting up and tending your own hives including collecting “homegrown” honey. Anyone interested in bees is welcome to attend. Cost: $50.00 for all five sessions. Registration: www.flandersnaturecenter.org or call 203-263-3711 x 10. Hurry and reserve your seat - group size is limited for best instruction. In an article from The Ecologist, livestock near fracking areas are getting sick or dying. Many of them are giving birth to stillborn calves. In a new report from an upstate New York veterinarian and professor of molecular medicine at Cornell University, evidence shows that there's a correlation between sick and dying cows and the chemicals in the air and water. In the midst of the US domestic energy boom, livestock on farms near oil-and-gas drilling operations nationwide have been quietly falling sick and dying. While scientists have yet to isolate cause and effect, many suspect chemicals used in drilling and hydrofracking (or “fracking”) operations are poisoning animals through the air, water, or soil. Last year, Michelle Bamberger, an Ithaca, New York, veterinarian, and Robert Oswald, a professor of molecular medicine at Cornell’s College of Veterinary Medicine, published the first and only peer-reviewed report to suggest a link between fracking and illness in food animals. The Today Show reported that the fish you're eating is just a big, fat bait and switch. Cheaper and lower quality fish--often times with high levels of mercury--are being labeled as higher quality fish. So you think you're getting a nice meal, but you may be paying through the nose for a bad one. Legislative lapse of the farm bill may have catastrophic consequences for dairy farmers, particularly in the Northeast. See an excerpt from an editorial published on October 7th in The New York Times below. Last week began without a farm bill, a legislative lapse of shameful proportions. Since 1949, the bill has always been renewed, but not this year. Even so, most of the 2012 crop is still covered by loans, insurance programs and commodity supports until the end of the year — with one important exception. That exception is dairy farmers. When the farm bill expired, so did the Milk Income Loss Contract Program, which pays dairy farmers when milk prices, which are always volatile, fall below a set level. The payment is also adjusted to the price of feed, which has been high, thanks to record corn prices, and will be much higher after this year’s nationwide drought. The program was designed to help small dairy operations, the kind that are prevalent in the Northeast. Typically, in New York, the program can provide a farmer with as much as 10 percent of his income. For all too many farmers — caught between diminishing demand for milk, historically low milk prices and historically high grain prices — that is the difference between bare survival and certain insolvency. What do farms have to do with climate change? A whole lot. But if you're in the House or Senate, you're not even considering that. The current farm bill being tossed around Congress will accelerate global warming with more greenhouse gas emissions while making farms more vulnerable to those emissions. In a "meat-heavy" food system like ours with very little crop diversity and chemical feritilizers, we've set ourselves up for the kind of summer we had this year: hot and dry with low crop yield. Why not try the organic approach to farming? Nah, agribusiness wouldn't hear of it! See the excerpt below from The New York Times about how the farm bill will actually affect the future. The farm bill is not only the centerpiece of United States food and agriculture policy, it is also a de facto climate bill. And in this respect, both the Senate and House versions of the legislation are a disaster waiting to happen. Consider, for a moment, the summer of 2012. For an agricultural superpower like the United States, it should have set off alarm bells. The hottest July on record and the worst drought in 50 years — both driven partly by global warming, scientists say — have parched soil and withered crops across the Farm Belt. Yet America’s lawmakers aren’t even remotely addressing the issue in a piece of legislation that will affect the climate profoundly for years to come. The proposed farm bill — Senate- or House-style, take your pick — would make American agriculture’s climate problem worse, in two ways. Not only would the bill accelerate global warming by encouraging more greenhouse gas emissions, it would make the nation’s farms more vulnerable to the impacts of those emissions. Indeed, instead of helping farmers take common-sense measures to limit their land’s vulnerability to extreme weather, the legislation would simply spend billions more on crop insurance — sticking taxpayers with the bill. “It’s like giving a homeowner cut-rate fire insurance but not requiring fire extinguishers,” said Jim Kleinschmit of the Institute for Agriculture and Trade Policy. While Starbucks Coffee Company may be a huge corporation and you can find one on every corner (if you look close enough to the Rover images from Mars, I think there's one there, too), they really do put their money where there mouth is. They talk about sustainable practices and recycled materials. But what about the coffee grounds and day-old pastries? They've taken today's garbage one step further to tomorrow's usable product. They break down the materials by a process that converts plant-based items into an acid. The acid can be used as detergent, medicine, or even plastics. Who knew today's cake pop and tall skim latté would have such an impact? See an excerpt from Environmental News Network below. According to the ACS, 1.3 billion tons of food is dumped in landfills, incinerated, or otherwise trashed every year around the world. They celebrate the success of Starbuck's new "biorefinery" at their 244th National Meeting and Exposition. "Our new process addresses the food waste problem by turning Starbucks' trash into treasure — detergent ingredients and bio-plastics that can be incorporated into other useful products," said Carol S. K. Lin, Ph.D., who led the research team. "The strategy reduces the environmental burden of food waste, produces a potential income from this waste and is a sustainable solution." The potential exists to expand this technology to not just coffee chains, but to all major food services, including school cafeterias. Between the new biorefinery and various composting technologies, not a single food scrap would ever have to be thrown away. Image courtesy of Starbucks Coffee Company. This is the perfect time to learn more about fermented foods. Our gardens and our CSAs are a blessing at this time of year. I know for myself, I usually have more food than I know what do to with and never want it to go to waste. So, an ancient way to keep foods from turning bad is to ferment them. The New York Times reported yesterday that more college campuses are doing away with the rolling green lawns in favor of farming. Institutions such as UMass at Amherst, Green Mountain College, and Duke University think an edible school garden is not only a great part of the curriculum but a more environmentally sustainable way to keep the grounds. Rather than pumping their grassy acres with fertilizer and weed killer, they're opting for a greener approach. Green Mountain College in Poultney, Vt., for example, has just finished turning the front lawn of one campus building into a garden for its Lawn to Edible Garden project. “We’re trying to bust open the notion of what a front lawn might look like,” said Philip Ackerman-Leist, an associate professor at the college who directs the project. He said the reason that Americans like grassy lawns so much is the country’s British roots. “The notion of the lawn is an import from the well-grazed areas of the British Isles,” he said, joking that a herd of sheep might be even better suited for a college quadrangle than a garden. Mr. Ackerman-Leist said 25 students had built their college garden in five days as part of an Edible Landscaping class. They focused on aesthetics and on limiting costs. “It’s difficult to eat local and buy local and do it on a budget,” he said, so the project teaches students and others in the community how local food can be produced right on the lawn. Image courtesy of Green Mountain College. Does overfishing really it's mean not sustainable? Just because some fish have been red listed--as in the case of Whole Foods removing some of the red listed fish from their stores--doesn't mean the stock of fish can't be rebuilt. That's where appropriate seafood labelling comes in. There's a difference between overfishing and the sustainability of the species that are naturally being replenished. The point? Be an informed consumer. We should be paying close attention to those fisheries that are actively trying to replace what they fish. That way, the cycle of life continues as does the species itself. Know your food. What are you putting in your mouth? Where did it come from? What kind of an impact is it making on the environment and are you partially contributing to the environmental decline by purchasing it? Beekeeper, author and founder of Red Bee Honey, Marina Marchese, will present a tour of her Red Bee apiary with an artisanal honey tasting of The Ark of Taste five US honeys in danger of extinction. The tasting of the Ark’s endangered honeys is the first event of its kind in the US. SFMN members and guests will be treated to an educational afternoon learning about how honey bees make honey and how honey is harvested all while tasting these coveted honeys and gaining a finer understanding of our traditional foods. Marchese will also discuss the vital importance of the role honey bees play in our food chain. The Ark of Taste is an international catalog of foods that are threatened by industrial standardization, the regulations of large-scale distribution and environmental damage. In an effort to cultivate consumer demand—key to agricultural conservation—only the best tasting endangered foods make it onto the Ark. Not surprising is the reality that all five honeys named by the Ark are all harvested in the US, a sobering fact that reminds the public that we must do more to preserve these honey plants, our biological diversity and our culinary heritage. Marchese is the president of the Back Yard Beekeepers Association in CT. She studied the sensory analysis of honey tasting in Montalcino, Italy and has presented her signature Honey Tasting Laboratory Workshops at top shelf NYC venues like Murray’s Cheese Shop, Artisanal Premium Cheese Center and Eataly. Slow Food Metro North will be honoring Ms. Marchese with a Snail of Approval award at this event. Tickets: $35 per person. 25 guest limit. On May 24th, from 6:30-10:00 PM, Wholesome Wave is celebrating its New England roots and love of local food with some of Connecticut's most celebrated culinary artists at Clark's culinary showroom in South Norwalk at this year's Whole Hog! The Whole Hog fundraising event will bring together Wholesome Wave's co-founder and President, internationally renowned chef, author and owner of The Dressing Room Michel Nischan, along with fellow chefs Tim LaBant of the Schoolhouse at Cannondale restaurant in Wilton, John Barricelli of SoNo Baking Company in South Norwalk, Bun Lai of Miya's Sushi in New Haven and Joe Wolfson, the new executive chef of Terrain Garden Café in Westport. Working with nontraditional cuts of local free-range pork, each chef will surprise guests with their unique interpretations featuring locally grown ingredients. Tickets for The Whole Hog are available for purchase online. Here's the thing about raising chickens in your backyard: You'll have more eggs than you know what to do with. Do they taste better? Yes. Are they more wholesome for you? Of course. Will you have enough at peak laying season to sink a ship? Surely. See an excerpt from today's New York Times about raising hens and how the trend has grown, particularly as a result of the economic downturn. The organic food movement hasn't hurt the trend, either. Here's what some people have been doing with the excess. FOR newly hatched chicken enthusiasts, the first egg from your own hens is a small miracle. “You want to dip it in gold,” said the writer Susan Orlean, who keeps nine hens at her home in Columbia County, N.Y.
Then comes the second egg: enough for a triumphant breakfast. But when the whole coop starts laying, she said, the supply of eggs quickly turns into an “I Love Lucy”-style conveyor belt scene, bringing absurd, unmanageable excess. Ms. Orlean scrambles them into a pile for brunch or dinner, sprinkled with Indian spices, slivered almonds and unsweetened coconut. “People will eat three and four eggs at a time that way, without blinking,” she said. It’s not unusual for food lovers to toy with the notion of adding chickens to a thriving garden or building a rooftop coop. Now the novelty has become reality: despite coyotes, foxes and the occasional cage-break, many urbanites and suburbanites are raising their own eggs. And many small farmers who supply restaurants with produce have been expanding into poultry, making farm eggs ubiquitous on restaurant menus. The eggs that were once scrubbed from the standard American breakfast over concerns about cholesterol have made a triumphant return as high-end appetizers, served atop anything and everything. A lot's happened over the past ten years. Republicans and Democrats swapped control in Washington and in Hartford. Wars started and ended. Housing and land prices went up and then crashed back down. The stock market went for a ride up and down and is now back up. It seems things are always changing. But for the last decade, one constant has been the efforts by the Connecticut Farmland Trust to save the dwindling number of farmland acres in the State of Connecticut. The core of what would become the Connecticut Farmland Trust (CFT) had its beginnings in 2001 when a group of concerned citizens got together, with the help of the Hartford Food System, to urge legislators to support the state’s fledgling farm preservation program. Through this effort the group discovered that while the State’s program worked well – some farms were not qualifying. That idea led to the incorporation of the Connecticut Farmland Trust on March 1, 2002. With just a board of directors and no permanent staff or office space, the group started to create the state’s only statewide land trust with the specific goal of saving the smaller working farms that would fall under the state’s radar. On Saturday, March 31st from 10:00 a.m. to 4:00 p.m., Fairfield Warde High School will again be the site for the third annual Food for Thought Expo. Sponsored by the Fairfield PTA's Fuel for Learning Partnership, a non-profit organization that promotes healthy food and nutrition for school lunches, the event will feature cooking demonstrations, workshops, and a number of local vendors offering fresh produce, meats, groceries, and ready-made foods. There will be children's activities and movies to keep the wee ones occupied. Want to learn how to garden? No problem! This is the place for you. You can also find out how to join a local CSA and talk to nutrition experts. There's something for everyone! Michelle McCabe, Fuel for Learning Partnership's Chairperson, said that eating healthy foods has become a top priority in this country. Americans have an increased level of weight gain with sedentary lifestyles. Over the last several years, we have also seen an increase in tainted food. The FFLP encourages the greater community to reach a common goal of serving safe, high quality, nutritional meals to the students of Fairfield. FFLP encourages positive change in how we eat by implementing healthy and sustainable eating practices. The event is free and open to the public. Fairfield Warde High School is located at 755 Melville Avenue. For more information, call 203-362-7169. An unusually warm winter has turned into an early spring, and lately I find myself day-dreaming about warm sunny days, deck parties with friends, and swimming in cool Maine waters. At our house, my husband is the gardener AND the cook, and over the past year, his interest has piqued regarding heirloom varieties. Our commitment to preserving food diversity and security drove us to seek out as many resources as we could. In fact, we found so many great on-line and print catalog sources for organic and heritage seeds and plants - complete with instructions - we thought it nice to share with our readers. One of our best discoveries this year was purely accidental. Last weekend a Sunday drive led us to Old Weathersfield, Connecticut - an amazing place that has been producing seeds for New England gardeners since 1811. Comstock, Ferre & Co. offers 250 varieties of open pollinated non-GMO seeds. The floors were old wide plank with rows and rows of paper seed packets. I think there must have been 50 different varieties of tomato seed alone - and we came home with enough seeds to keep us in vegetables for ten years! In addition to Comstock Ferre & Co. , we have a surprising number of great resources are right here in New England including the High Mowing Seeds located in Wolcott, Vermont and Fedco Seeds of Waterville, Maine. Another Maine based seed company, Johnny’s Selected Seeds, has a large selection of heirloom and organic seeds available. igI am sure that I have missed many other worthy enterprises here in our region, so look around and see what might be available right in your community! Check www.permacultureactivist.net/seeds/SeedResrcs.htm for an excellent list of heritage and open pollinated seed companies. In addition, the Seed Savers Exchange in Iowa is an excellent resource for anyone interested in the preservation of our seed heritage. Happy planting! Elizaebth Conrad is co-founder of Common Good Market, a New England (Virtual) Town Square Market for the 21st Century offering an outstanding selection of high quality sustainable and eco-friendly products for the home made by New England artisans and crafts-people. Common Good Market believes that buying locally made products helps build more resilient local economies, leads to improved environmental outcomes for our region, and a better future for our children. Visit Elizabeth's blog to read more. Shiitake mushrooms have been used for thousands of years in Asia for both cooking and medicine. And when it comes to cooking, they are the second most popular mushroom in the world. They are also becoming more prominent in the alternative health care market. There has been some research done on them to see how they can be best put to use. Nutritionally, shiitake mushrooms are a good source of B vitamins, iron and other minerals, protein, vitamin D and fiber. They are also low in calories and are very tasty either lightly sauteed or even dehydrated. Their most known health use is in the treatment of cancer. Lentinan, a polysaccharide found in shiitake mushrooms, has been shown to be both anti-cancer and to improve the quality of life with several types of cancers. The most common way to take it is in pill form, but most of the research is on when it is given intravenously. An Associated Press report cited on the Wall Street Journal noted that a Connecticut bill seeks to add appropriate GMO labeling on foods. While there has been much debate over whether or not GMOs are actually harmful to one's health--the FDA says yea; anyone with a brain says nay--the point is to have the opportunity to choose or not choose foods with GMOs in it. Fairfield Green Food Guide's Analiese Paik, a past contributor on this site, testified in favor of the labeling saying, "The burden of proof is on the FDA to prove that it's safe." See the excerpt below from yesterday's posting. HARTFORD, Conn. — Consumers at Connecticut grocery stores would be able to know if genetically engineered foods are in the merchandise mix under a bill state lawmakers are considering to require the labeling of such foods. Neither the federal government nor any state currently has a labeling requirement that applies to all genetically modified foods. Connecticut is among nearly 20 states considering a labeling mandate amid health concerns that supporters of the legislation have raised about such foods. Connecticut's legislation would require clear labeling on any food sold in the state that is completely or partially produced with genetic engineering. Rep. Richard Roy, D-Milford, said he introduced the legislation due to public concern over the issue. Roy co-chairs the state Environment Committee, which heard from supporters and opponents of the bill at a hearing Wednesday. Roy said his bill has gained bipartisan support, and he expects the committee to pass it, although its fate after is unclear. "We're not taking a stance on whether GMOs (genetically modified organisms) are good or bad," said Roy. "What we're saying is that we have a right to know what we're putting in our bodies." Kate McLaughlin has studied fish all over the country—from herring in Massachusetts’s rivers to Steelhead Trout in northern California. She is currently Blue Ocean Institute’s Seafood Program Director. Eight conservation groups in the U.S. & Canada teamed up to get the word out about ocean-friendly seafood. The message? Look for ocean-friendly seafood choices that you can be happy about. Why should people Be Happy about their seafood choices? Seafood can be a great addition to any family’s menu. Who doesn’t want a low-fat, high omega-3 addition to their dinner plate? And just as you’re thoughtful about other environmentally-responsible choices you make (like recycling, or buying farmers market vegetables), you can be thoughtful about your seafood choices and be happy with the results. 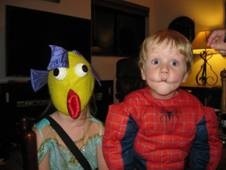 People can go to www.facebook.com/BeHappyFish to learn more about ocean-friendly seafood, find family- (and ocean!) friendly recipes, , and show support for the ocean by signing a pledge to support ocean-friendly seafood or posting a pic of your best fish face. What are some ocean-friendly choices that people can be happy about? Farmed mussels are a great choice. Mussels can filter 10-15 gallons of water a day, eating microscopic plankton they strain out of the water. Since mussels filter their food from their surroundings, we don’t have to catch wild fish to feed to them (as is the case with some farm-raised seafood, like Atlantic salmon). Other great choices are U.S. farmed catfish, farmed Arctic char, wild Alaskan salmon, and Pacific cod. You can find recipes for all of these fish on the Be Happy Facebook page. In the above list of ocean-friendly choices, there’s a mix of farmed and wild fish. Should people be asking where their fish comes from and whether it’s farmed or wild? Asking where your seafood comes from is a great first step in getting to know the fish you’re eating. Next time you’re at the store, look for signs in the seafood case that note whether it’s farmed or wild, and you’ll see there’s more farmed seafood out there than you might have guessed. Why is Blue Ocean involved with the Be Happy outreach effort? Blue Ocean works with seafood lovers, scientists, and chefs to communicate the science of seafood. And now we’ve teamed up with seven other organizations in the U.S. & Canada to help more people from coast-to-coast find seafood choices they can be happy about. What if you could get farm fresh food delivered to your door exactly as you ordered it? If you’re Deb Marsden, you think that’s a great idea, too. In fact, that very idea is what inspired her to start her own business four years ago. Marsden’s CT Farm Fresh Express (CTFFE) is a delivery service that brings the farm into your home. This Saturday will mark their fourth anniversary. We've talked about school lunch before on this site. We feel strongly about what our kids eat, what we eat, and the quality of sustainable foods and farming. This site also reported on the topic a couple of months ago when lawmakers considered pizza a vegetable serving because of its two tablespoons of tomato paste per serving. Reuters reported today that the USDA has done a small overhaul of school nutrition to include more fruits and vegetables and skim milk. They have also mandated a child-size portion and lower sodium, among other things. About time, isn't it? See the excerpt below. WASHINGTON/LOS ANGELES (Reuters) - U.S. school children, accustomed to a steady diet of pizza and French fries, will find more fruits, vegetables and whole grains on their trays under new government rules announced on Wednesday. The new U.S. Department of Agriculture (USDA) rules aim to boost the nutritional quality of the federally funded meals consumed by roughly 32 million U.S. school children. The rules represent the first major revision of school meal standards in more than 15 years and are intended to combat the nation's childhood obesity crisis -- nearly one in three children in America is overweight or obese. The revamp comes just months after U.S. lawmakers protected pizza's status as a vegetable and killed proposed limits on weekly servings of starchy vegetables like potatoes. The Science and Development Network, a non-profit organization based in England and Wales, reported that research has shown traditional farming is crucial for keeping certain species alive. The research was conducted in developing countries as well as Europe. Traditional farming methods are crucial for protecting a number of threatened bird species in the developing world, including bustards, cranes, ibises and vultures, a study has found. Livestock grazing and features associated with arable farming — such as hedgerows — create environmental conditions that certain birds currently depend on for food, shelter and breeding, the authors report. But as industrial farming methods eliminate these habitats, these species are threatened with extinction, said Hugh Wright, a researcher in the School of Environmental Sciences at the University of East Anglia, United Kingdom, and lead author of the study, published in Conservation Letters earlier this month (5 December). Avocados are a very poorly understood fruit. They got a bad rap due to their high fat content, both in terms of cholesterol and weight control. The only place you might find them would be your nearest bowl of guacamole. Until recently, it wasn't understood that the type of fat found in avocados is acutally “good” fat. Avocados originated in Mexico as early as 7,000 BC. Later, it was determined they could be found in South America as well. It seems, however, that when they started cultivating them in California in the late 1800s, that they became more accessible. Because of the high fat content, avocados have a lot of calories. But, there is some good news. Not only are the highest levels of fat found monosaturated, but with all the other vitamins, nutrients, phytochemicals and fiber, eating avocados is actually GOOD for your health. Americans’ right to access fresh, healthy foods of their choice is under attack. Farmageddon tells the story of small, family farms that were providing safe, healthy foods to their communities and were forced to stop, sometimes through violent action, by agents of misguided government bureaucracies, and seeks to figure out why. Filmmaker Kristin Canty’s quest to find healthy food for her four children turned into an educational journey to discover why access to these foods was being threatened. What she found were policies that favor agribusiness and factory farms over small family-operated farms selling fresh foods to their communities. Instead of focusing on the source of food safety problems — most often the industrial food chain — policymakers and regulators implement and enforce solutions that target and often drive out of business small farms that have proven themselves more than capable of producing safe, healthy food, but buckle under the crushing weight of government regulations and excessive enforcement actions. Farmageddon highlights the urgency of food freedom, encouraging farmers and consumers alike to take action to preserve individuals’ rights to access food of their choice and farmers’ rights to produce these foods safely and free from unreasonably burdensome regulations. The film serves to put policymakers and regulators on notice that there is a growing movement of people aware that their freedom to choose the foods they want is in danger, a movement that is taking action with its dollars and its voting power to protect and preserve the dwindling number of family farms that are struggling to survive. The film is presented by Westport Cinema Initiative and the Westport Farmers Market. The event is sponsored by Whole Foods Market. If you think hiring local is the answer to all our unemployment woes, you're not alone. Farmers across the nation are looking to hire. Not cheap immigrant workers, mind you, but local people who are unemployed and hoping to make ends meet. The problem is, nobody wants to do the manual labor even if they are out of work. For years, we've lost valuable farm land to overdevelopment. Now, we have the opportunity to return to the land. But unfortunately, we're not. See the excerpt below from The New York Times. OLATHE, Colo. — How can there be a labor shortage when nearly one out of every 11 people in the nation are unemployed? That’s the question John Harold asked himself last winter when he was trying to figure out how much help he would need to harvest the corn and onions on his 1,000-acre farm here in western Colorado. If nothing else makes it clear how difficult and tenuous farming is, the after-effects of Hurricane Irene should be a wake-up call. With 10 inches of rain or more, thousands of acres of crops were lost to flooding in New York, New Jersey, Vermont, and western portions of Massachusetts and Connecticut. The vegetable delivery from my own CSA, Stoneledge Farm in South Cairo, NY, has been shut down for the rest of the season. With some portions of their crops under as much as 10 feet of water, the FDA declared it—along with produce from a number of other farms—a food safety risk and inedible. In parts one and two of my series on coconuts, I introduced you to two of the ways coconuts are said to improve your health. In this part three of the series, I will tell you how coconut trees are extremely eco-friendly and economical. Coconut trees are found mostly in the tropics as they need to be in full sunlight and have lots of water. They are called “Trees of Life” in the Philippines because so many of their parts can be used in daily life. The above uses of the whole coconut tree are how it’s been used for thousands of years in the Pacific Islands. What makes the trees even more amazing is how they will be used in the future. One company, Whole Tree, Inc., is finding ways to use the discarded products of coconut farming to make packaging products. Another company is researching ways to make car parts that are both eco-friendly and help indigent coconut farmers in Asia and the South Pacific. It has also been used as a biofuel in the Pacific Islands, though that might not be environmentally or economically beneficial in the long run if used worldwide. Overall, the coconut tree is an amazing work of nature. The whole tree can be used to support life both inside the body and in its surroundings. More research needs to be done in both these areas to make the most of this extraordinary tree. Coconut oil has recently gained a lot of attention. It is said to help with cholesterol levels, obesity and metabolism, for example. It is being touted as the best oil on earth, either incorporated into your cooking or taken as a dietary supplement. So why is something that’s been used in Asia for thousands of years only becoming popular in the US now? Coconut oil got its bad reputation because some studies were done on partially hydrogenated coconut oil causing high cholesterol, which is not the same thing as the virgin coconut oil that’s being celebrated, and discussed, today. Though virgin coconut oil has the saturated fats lauric, caprylic and capric acids, saturated fats are needed in the body for proper cell membrane function. Glen Colello and Lisa Storch are co-owners of the café Catch a Healthy Habit in Fairfield. With a name like that, their customers know they are walking into a special place. Health conditions like obesity and heart disease, which can stem from processed foods, are running rampant in this country. It is a breath of fresh air to know that two people are trying to stop it. By educating the community on healthy food habits, Glen and Lisa are important members of the community for more reasons than one. Every five years the USDA (United State Department of Agriculture) puts out a new guideline in which Americans should follow for optimum health, specifically nutrition. The usual time frame was interrupted due to the alarming rate of diseases linked to diet. Raw food in a diet is crucial for a healthier life. “Dietary Guidelines for Americans” embraced the value of plant-based diets. Vegetarian–style eating has been linked to improved health. “Lower risk of obesity, lower cardio vascular diseases and lower total mortality are a few of the big risks slashed when a person is a vegetarian”. Vegetarians are also connected with proof of generally lower BMI (Body Mass Index). Today there are about 5 common types we see in markets: Seeded, Seedless, Mini, Yellow and Orange. Watermelon is packed full of nutrition, hydrates and is also low-fat! It is a great source of vitamin A which contains antioxidants; Vitamin C which can heal and strengthen the body and B6 which helps convert protein to energy. Lately, I’ve been asked a lot about which is better: Buying locally or buying organically? It is an ongoing debate that may never be answered to anyone’s satisfaction. You just have to decide which is right for you. So, to help you decide, here are some facts. Probably everyone has at least heard about the goji berry. They are popular in health food stores and are used in packaged baked goods. So what is about them that makes them so great? To begin with, they have been used in Traditional Chinese Medicine (TCM) for thousands of years, which indicates a profound amount of research! The botanical name for the goji berry is Lycium barbarum, which is the reason it is also called lycium fruit in TCM. Also referred to as wolfberry fruit, it is the berry of a deciduous woody perennial plant that makes up the largest crop in China. They are also grown in Tibet near the Himalayas. Unfortunately, they also use a lot of pesticides, so it’s important to be careful of which brands you buy. Kevin Staehly thinks he’s on to something. He launched a delivery service, The Simply CT Store, which provides fresh organic produce from his family’s farm in East Haddam. Along with baked goods from Gottas Cider Mill in Portland and handmade artisanal cheeses from Sankow’s Beaver Brook Farm in Old Lyme, he has a nice selection of tasty treats to choose from. Much like Pea Pod through Stop & Shop, you can access an order form online and have it brought to your home. Deliveries take place three times a week on Tuesdays, Thursdays, and Saturdays. And if you miss the cutoff for delivery, no worries. They still offer all of their products at their farm stand and at the farmer’s market in Madison.